In Effective Cybersecurity, William Stallings introduces the technology, operational procedures, and management practices needed for successful cybersecurity. Stallings makes extensive use of standards and best practices documents that are often used to guide or mandate cybersecurity implementation. Going beyond these, he offers in-depth tutorials on the “how” of implementation, integrated into a unified framework and realistic plan of action. Each chapter contains a clear technical overview, as well as a detailed discussion of action items and appropriate policies. Stallings offers many pedagogical features designed to help readers master the material: clear learning objectives, keyword lists, review questions, and QR codes linking to relevant standards documents and web resources. 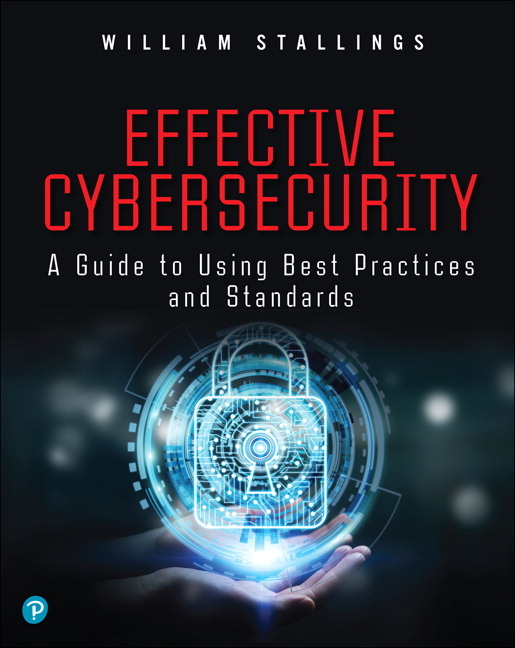 Effective Cybersecurity aligns with the comprehensive Information Security Forum document “The Standard of Good Practice for Information Security,” extending ISF’s work with extensive insights from ISO, NIST, COBIT, other official standards and guidelines, and modern professional, academic, and industry literature. Dr. William Stallings has made a unique contribution to understanding the broad sweep of technical developments in computer security, computer networking, and computer architecture. He has authored 18 textbooks, and, counting revised editions, a total of 70 books on various aspects of these subjects. His writings have appeared in numerous ACM and IEEE publications, including the Proceedings of the IEEE and ACM Computing Reviews . He is a 13-time recipient of the award for the best computer science textbook of the year from the Text and Academic Authors Association. In more than 30 years in the field, he has been a technical contributor, technical manager, and an executive with several high-technology firms. He has designed and implemented both TCP/IP-based and OSI-based protocol suites on a variety of computers and operating systems, ranging from microcomputers to mainframes. Currently, he is an independent consultant whose clients have included computer and networking manufacturers and customers, software development firms, and leading-edge government research institutions. He created and maintains the Computer Science Student Resource Site at ComputerScienceStudent.com/. This site provides documents and links on a variety of subjects of general interest to computer science students (and professionals). He is a member of the editorial board of Cryptologia , a scholarly journal devoted to all aspects of cryptology. Dr. Stallings holds a Ph.D. from M.I.T. in Computer Science and a B.S. from Notre Dame in Electrical Engineering.